Posted by dr. gonzo in Architecture, Courthouses. If you leave the Belvidere Cemetery and travel down Main Street you will come to the original Boone County Courthouse. Unlike the Wright building detailed yesterday, the Boone County Courthouse does not hold the status of listing on the National Register of Historic Places. But it is still a historic structure and a fine example of Italianate architecture. (Wiki warning: article not by me but not horrible). The courthouse, erected in 1854, is the second structure to stand on the site and the grounds include two other buildings: the sheriff’s office and jail, and a county office building. 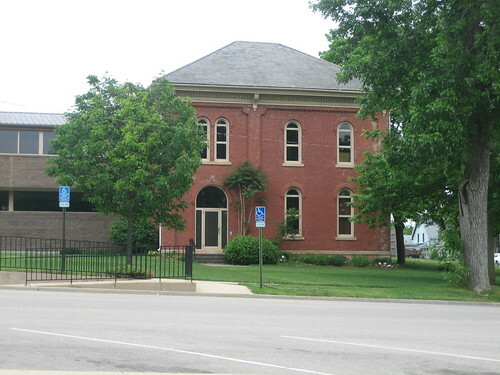 The office building was built separately in 1878 and the sheriff’s office and jail was constructed in 1898. Boone County’s history dates to March 3, 1836 when it was cut out of Winnebago County and named for famous Kentucky settler Daniel Boone. 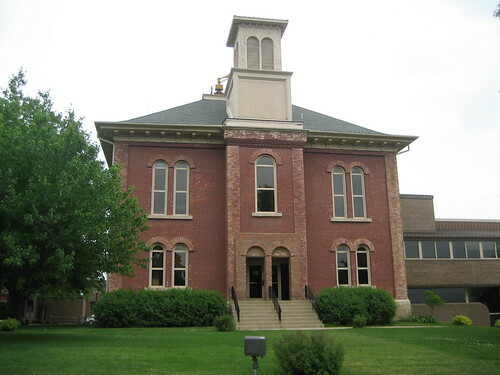 Belvidere was laid out on the north side of the Kishwaukee River and the first courthouse constructed; from 1837 on Belvidere has served as the county seat of Boone County.